A batch of never-before-seen FBI files on late Fox News chief executive Roger Ailes, obtained exclusively by Gizmodo and nonprofit Property of the People, reveals new details about the powerful and controversial media figure who died last year amid multiple allegations of sexual misconduct. A former media consultant to Presidents Ronald Reagan and Richard Nixon prior to his rise as a media mogul, Ailes is widely considered one of the most influential figures in modern American politics. Fox News, which Ailes founded in 1996, at one point drew audiences larger than CNN and MSNBC combined. Its staunchly conservative programming, which blurs the lines between news and entertainment, and sometimes reality, is widely credited with helping create America’s fiercely divided political climate. Ailes resigned as the network’s chief executive in July 2016 amid allegations of sexual harassment and abuse, brought by at least 10 women at the time of his death, including former top Fox News commentators and anchors Gretchen Carlson, Andrea Tantaros, and Megyn Kelly. Some allegations stretch back to his time as executive producer on The Mike Douglas Show in the 1960s. The 113 pages of FBI documents, obtained through Freedom of Information Act (FOIA) requests, are largely comprised of the FBI’s background checks into Ailes pertaining to his work as a media consultant for the Reagan and Nixon administrations. The cache conspicuously lacks any documents dated later than 1990—a detail that sits at a center of two ongoing lawsuits against the FBI over the more than 30 pages the Bureau explicitly refused to release and many others Gizmodo has reason to believe exist. The files the FBI did turn over include notes about his personal life, schooling, and agent interviews with his past business associates, colleagues, and neighbors, none of whom appear to have said anything negative about Ailes. He’s described in glowing terms—as a “well behaved” and “honest” person “of good character.” The nearly 50-year-old descriptions stand in stark contrast to the monster he’s believed to have become. Copies of Roger Ailes fingerprints taken by the US Secret Service in August 1969. The records show that on April 3, 1981, Ailes was interviewed by the FBI after tickets to the Tomorrow Show, which Ailes produced for NBC, were found in the possession of President Reagan’s would-be assassin, John Hinckley Jr. The FBI was told there was no way to determine whether Hinckley had attended the show, which taped just weeks before the attempted assassination. Hinckley was obsessed with the 1976 film Taxi Driver, in which Jodie Foster plays Iris, an adolescent prostitute. He wrote to Foster shortly before the assassination attempt in which he wounded Reagan, a police officer, a Secret Service agent, and White House Press Secretary James Brady. Ailes told the FBI that neither Foster nor Robert De Niro, who played the film’s lead character, had been guests on the program. The FBI was ultimately unable to confirm if Hinckley attended the show. One of the FBI background checks from 1990 references what appears to be Ailes’ only run-in with the law prior to the sexual harassment allegations: criminal possession of a weapon, for which Ailes was arrested in November 1974. According to Gabriel Sherman’s definitive biography, The Loudest Voice in the Room, Ailes was arrested in New York City for illegally possessing a gun shortly after returning from a trip to Kenya with Robert Kennedy Jr.
A copy of Roger Ailes criminal history obtained by the FBI during a background check. Ailes was arrested for a Class D felony (criminal possession of a weapon) but the charge was later reduced to a misdemeanor. 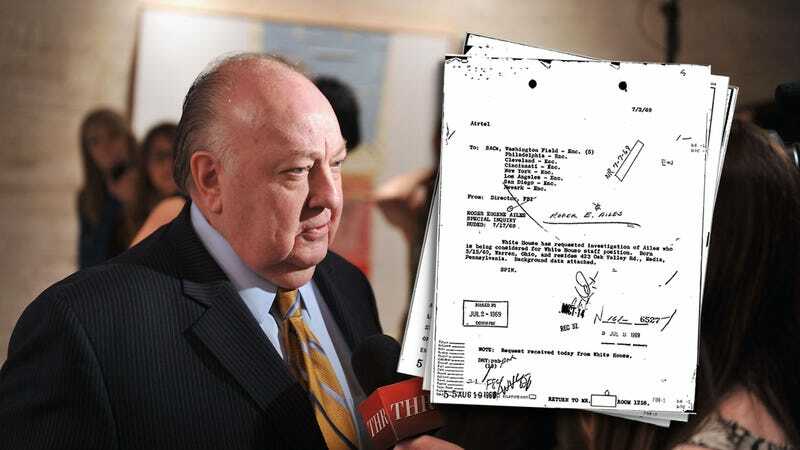 The documents further include copies of Ailes fingerprints, his Social Security number (293-34-9192), and his unremarkable grade-point average at Ohio University (2.698), where he majored in radio and TV in the early 1960s. The FBI released the files in response to lawsuits brought by Gizmodo Media Group and Property of the People. The ongoing lawsuits in New York and Washington, DC, follow the FBI’s failure to respond properly and in a timely manner to FOIA requests filed separately by both entities last year. Due to the questionable absence of any files from the past nearly three decades, Gizmodo will appear in court on Friday to argue that the Bureau’s production is almost certainly incomplete and likely the result of an inadequate search of its voluminous files. Records held by the FBI on US citizens are typically private and not for public consumption, but an individual’s right to privacy largely evaporates upon their death. Gizmodo filed its initial request for Ailes’ FBI files on May 18, 2017, the day he died from a traumatic brain injury, which was aggravated by hemophilia that had plagued him for most of his life. “It’s encouraging that we’ve gotten documents, but there’s nothing from the past 30 years, and we’re looking forward to seeing the FBI’s explanation in court,” said attorney Dan Novack, who represents Gizmodo pro bono in its lawsuit against the FBI. Ryan Shapiro, a PhD candidate at MIT and co-founder of Property of the People, which sued for the records in the US District Court for the District of Columbia, called the FBI’s response to the FOIA requests woefully deficient. “Quite simply, the Bureau’s claim it couldn’t locate any documents on Ailes dated more recently than 1990 is preposterous on its face,” he said. An FBI field report of an interview with an Ailes associate. The investigation was requested by Nixon White House assistant John D.Ehrlichman in July 1969. The New York Daily News revealed a federal probe into Fox News in April 2017, just weeks before Ailes died. The investigation reportedly focuses on payouts the company made in secret to women who had accused Ailes of sexual harassment. CNN further reported that financial crimes experts had been enlisted by the U.S. Postal Inspection Service to join the probe. While the FBI generally withholds records relevant to an ongoing investigation, the ongoing investigation into Fox News is apparently not among the reasons cited in its response to the FOIA requests for withholding additional records related to Ailes. Since those records clearly exist, but were not apparently reviewed at any point in the processing of Gizmodo’s request, it seems clear the FBI’s search for records was inadequately performed. One exemption the FBI cited under the Privacy Act of 1974—which Gizmodo intends to challenge since we did not request records under the Privacy Act—allows the omission of records related to a wide range of “investigative efforts pertaining to the enforcement of criminal law including efforts to prevent, control, or reduce crime, or apprehend criminals,” the FBI wrote, which may include reports generated by FBI informants and investigators. Find a complete copy of the records we’ve obtained so far below.